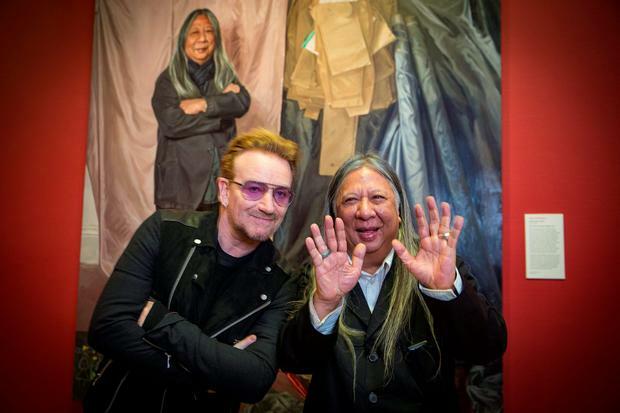 Bono and John Rocha at the unveiling of a portrait of the designer by artist Geraldine O’Neill at the National Gallery of Ireland in Dublin. Left, Ali Hewson. Photo: Arthur Carron. "It feels like Christmas Day," fashion designer John Rocha exclaimed at the unveiling of his portrait in the National Gallery of Ireland last night. It was a small but star-studded affair with Bono, Guggi, Ali Hewson and John's designer daughter Simone all attending the event. "I'm a very big fan of John's," Bono told the Irish Independent. "He's an extraordinarily talented man and an extraordinary gift to our country." A portrait of the U2 frontman once graced the walls of the gallery but Bono believes the curators took it down "after the release of the last album" on iTunes. Artist Geraldine O'Neill, who was shortlisted for the inaugural Hennessey Portrait Prize in 2014, created the impressive piece of work which shows Rocha standing in front of swathes of fabric. "He was a fantastic person to paint," O'Neill said. "I don't paint that many portraits but we just clicked straight away. It was an extremely enjoyable experience." Top designer John was joined by his wife and business partner, Odette, his fashion designer daughter, Simone, and his new granddaughter, Valentine. "I'm thrilled," John said. "It's the highest honour I've had in this country, it's a wonderful occasion and a very special night." Rocha is the latest in a series of well-known figures in Irish life to enter the National Portrait Collection. He follows in the footsteps of Sr Stanislaus Kennedy, Michael Longley, Seamus Heaney, Brian Friel, Maeve Binchy, and Mary and Nicholas Robinson. Born in Hong Kong, John Rocha moved to London in the 1970s to study fashion in Croydon College. He was inspired to move to Ireland having used Irish linen in his graduate collection. He has lived and worked in Dublin for the past 35 years and is considered one of Ireland's best regarded designers. In 2002, he was awarded the CBE in recognition of his contribution to the fashion industry and opened his flagship store in Mayfair in 2007. Last year he announced his retirement from London Fashion Week and the catwalk, saying that he wished to "live by my calendar and not that of Fashion Week". During his career, he has also worked extensively with crystal, jewellery, architecture and interiors.